Introducing Microsoft Surface - The most productive device on the planet. With the ability to run desktop software, a USB port, and an integrated Kickstand, Surface 3 is the perfect productivity device for school, home, and on the go. Includes Office 365 Personal. Barely tipping the scales at 1.76 pounds, the 12-inch Surface Pro 3 has all the power and performance of a premium laptop in a thin and lightweight design. 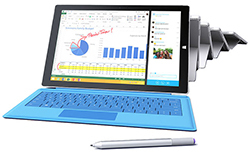 It also comes with the Surface Pen which delivers a natural writing and drawing experience. SoftSolutionWorks.com is a division of Virtual Graffiti Inc, an authorized Microsoft Partner.